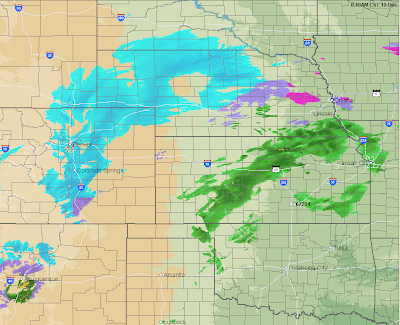 Almost as if on cue, the snow has rapidly begun to increase over Nebraska and northeast Colorado. The winds in the area generally gusting in the 25 to 35 mph range but they will increase in speed during the day., Travel conditions on I-80 and I-76 will rapidly deteriorate as the snow area enlarges, the rates of snowfall increase, and winds strengthen. 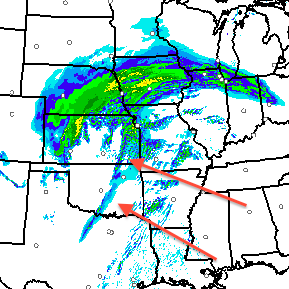 Addition: This is the forecast radar (without winterization) for 6pm CST. The line (arrows) is where thunderstorms should begin to form this evening that may become severe tonight (see posting below). Virtually all the rest of the precipitation from western Kansas to Iowa will be in the form of snow. The models were about 3 hrs too fast with the start of the snow here in Denver. That may seem trivial, but the difference between a 2a start and a 5a start to the snow impacts a lot of school district decisions. Otherwise, the general 'gist' to the storm seems accurate. Most metro area schools are operating normally as the precip is expected to be out of here by mid afternoon and this IS Colorado after all. I understand the schools out on the plains are closing though.